I wouldn't say I'm necessarily a non-believer, just more of a skeptic. Why is it that everyone else has creepy ghost stories or knows someone who knows someone who saw an exorcism? For a long while, I've been saying that maybe I'd change my spiritual outlook if only I could see something firsthand. Well, as the cliché goes: You ask and you shall receive. 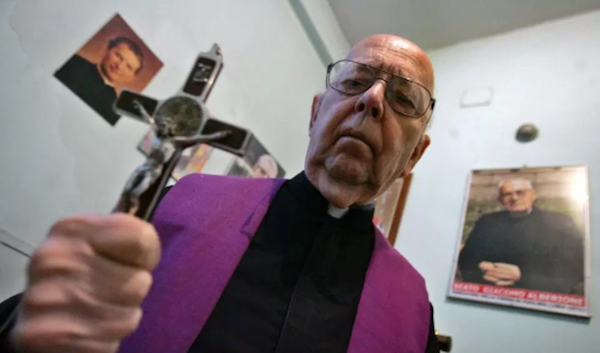 Exorcist director William Friedkin's new film, The Devil and Father Amorth, a documentary that follows Father Gabriele Amortha as he performs his ninth exorcism, premiered on August 31st, and word on the street is it's a real life horror film. Friedkin himself called the event "terrifying" when speaking to Variety, going on to add "I went from being afraid of what could happen to feeling a great deal of empathy with this woman’s pain and suffering, which is obvious in the film." "I consulted with neurologists, brain surgeons, some of the best in the United States. The brain surgeons had no idea what her affliction was and none of them would recommend an operation. They believe that everything originates in the brain but — and they say this in the film — they have never seen anything quite like these symptoms….Then the psychiatrists…all described how psychiatry now recognizes demonic possession. It’s called dissociative identity disorder/demonic possession. And if a patient comes in and says they are possessed by a demon or a devil, they don’t tell them that they are not….They do whatever psychiatric treatment they think is necessary, including medication. And they bring an exorcist in." Who knows, maybe this film will be enough to have my skeptic head spinning. What do you think? Are you curious to check out this documentary, or is it something you'll superstitiously avoid? Do you or anyone you know have any firsthand exorcism stories? We want to know. Share your thoughts and feelings in the comments section below, and, as always, remember to viddy well!